Epacha Game Lodge and Wellness Spa. Only 60 km from Etosha. Epacha Game Lodge and Spa is a 13000 Hectare Natural environment. The lodge has the perfect location for the discerning traveller that enjoy some comfort on their holidays. It is a private game reserve and only 60 km from the Etosha national entrance gate near Okaukuejo. The Epacha game lodge offers a Victorian style of design. It is an excellent combination of safari, luxury and wellness relaxation. 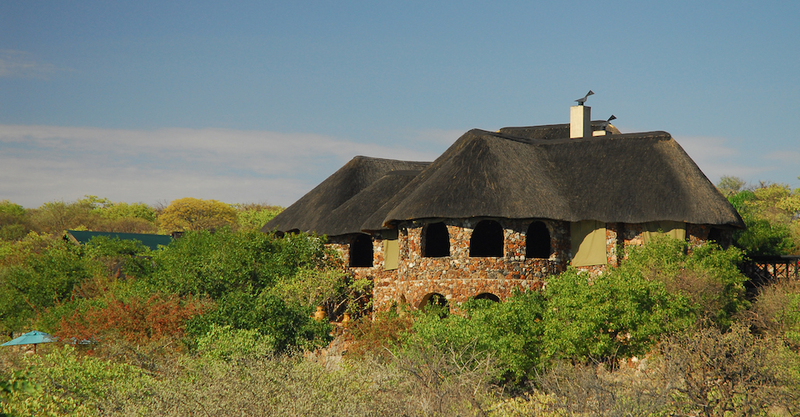 The Lodge offers 18 luxurious chalets on a hill overlooking the Game Reserve. Each Chalet has a balcony with ensuite bathrooms a mini bar along with Tea and Coffee Facilities. There is also a more luxurious private option of the Royal Impala Private Villa. You are welcome to select your level of comfort when you visit Epacha Game Lodge and private game reserve. The Pioneer Spa at Epacha offers Jacuzzi, Sauna, Steam Room and five treatment rooms. It is the ideal location to relax during your Namibia safari Holiday. Epacha provides three types of accommodation at the Lodge. The Private Royal Impala Villa. The variety of accommodation offers excellent opportunity to experience the natural wilderness of Namibia. The Eagle Tented Camp is more of an authentic Hemingway style of safari accommodation. The tents are with spectacular views and offer the feeling of being surrounded by nature. The Safari Tents have ensuite bathrooms and are the perfect African tented luxury accommodation. Epacha Game Lodge is close enough to enjoy the wildlife of Etosha and the tranquillity of comfort of a private game reserve. RATES INFO: Stay 2 nights and recive 30min free treatment from the Spa. 10 Day Namibia Camping Adventure. Explore the highlights of Namibia and camp in the wild. Visit Etosha national park on your way. Join our Etosha Photographic safaris and learn about wildlife photography in Namibia. The perfect introduction to digital photography. Book Now. Northern Namibia safari is rated the best-accommodated safari for 2018. Book now and join our team on this amazing safari adventure. Etosha Camping safari will take you to the Etosha National park for 2 nights and 3 days. The perfect camping safari for short stay travellers. Four Rivers safari will be visiting Etosha national park. Best safari for 2016. Wildlife, culture and adventure combined. Book now limited departures. Etosha Swakopmund adventure safari is an accommodated trip. This is the Etosha and swakopmund blitz safari and suitable for travellers with limited time. Etosha National Park is home to the largest variety of mammals and birds in Namibia. Special thanks goes to Montse Garcia, Ongava Game Reserve, Onguma Game Reserve and The Mushara Collection.